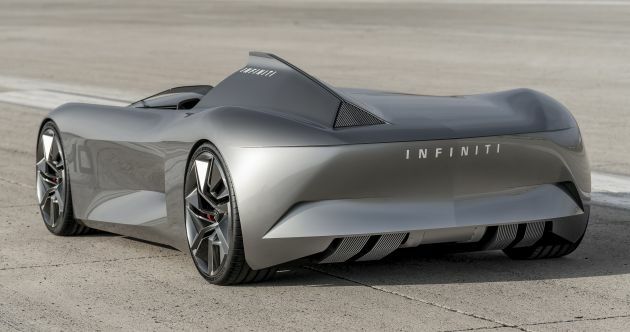 Infiniti unveiled a stunning sports car concept at the Pebble Beach Concours d’Elegance over the weekend, the Prototype 10. Unlike last year’s Prototype 9, which was a hodgepodge of the German Silver Arrows of the 1940s, the new show car is resolutely modern, but still looks back to early Californian speedsters. This forward-looking approach is evident in the front end, where the company’s signature double arch grille, already simplified on the Q Inspiration Concept, has been kicked completely to the kerb. The only elements that remain are the slit-like headlights, slim air intakes and a black chin spoiler at the front to increase downforce and channel air underneath the flat underbody. The rest of the car is long and low, and consists of austere straight lines inspired by origami, referencing the shocking sudden acceleration enabled by the electric powertrain – one trait shared with the Prototype 9. 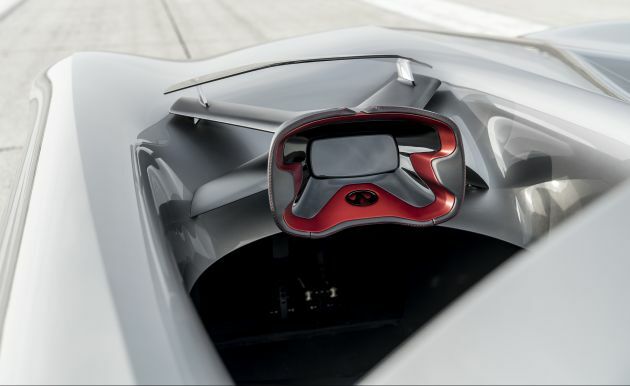 The uninterrupted power delivery of the motor is also visualised by the clean, unbroken surfaces, while the monoposto seat layout is claimed to show Infiniti’s driver-focused approach to its cars. Behind the driver, the structure of the cooling ducts appear to take after an electrical pulse, and the upright tail fin goes over the tapered rear deck and ends in a triangular tail light. A subtle rear diffuser draws air from underneath the car. The Prototype 10 is the first car to be overseen by new design director (and BMW veteran) Karim Habib, and is expected to inform the designs of Infiniti’s future models. Protected only by an ultra-thin windscreen, the pared-back cockpit features only a black leather driver’s seat, a four-point harness, pedals and a steering wheel, which dispenses with a steering column (enabled by Infiniti’s steer-by-wire Direct Active Steering system) and is held in place only by a carbon fibre strut. The red centre of the wheel is inspired by the brand’s logo and is drawn inwards towards a digital instrument display. 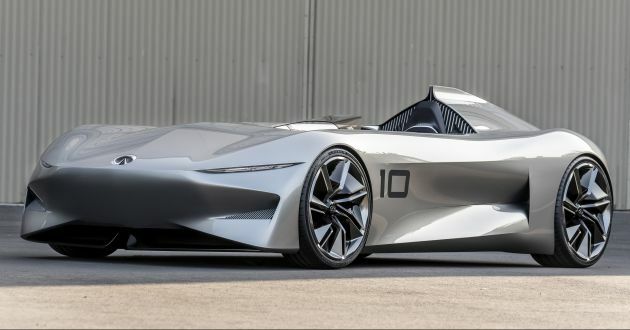 Although no powertrain or performance details were released, the Prototype 10 is said to preview Infiniti’s future direction in electrification. Nissan’s luxury offshoot confirmed that from 2021, all of its cars will be electric powered, consisting of a mix of pure battery electric offerings and range extender e-Power models – the latter as we’ve seen on the Nissan Note and Serena e-Power. The Prototype 10 also hints at the potential of Infiniti’s rigid, modular platforms, with a flat floor improving design and packaging – enabling the seat to be placed low in the chassis, for example. Those platforms will also allow the electric powertrains to be placed in new and creative ways in vehicles in all shapes and sizes, such as sedans, SUVs and sports cars, with support with a variety of drivetrains including a new electric all-wheel drive system (e-AWD).